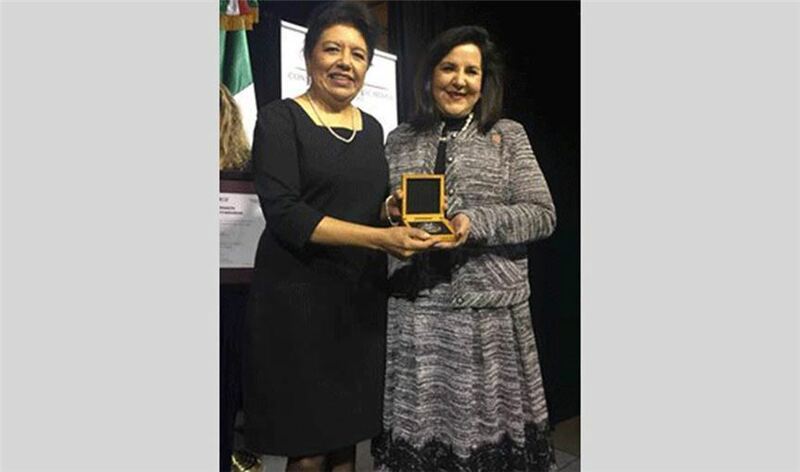 LAREDO, TX (November 27,2018) - IBC Bank Vice President of Marketing Margarita Flores was recently honored with the inaugural Distinguished Mexicans award from the Institute for Mexicans Abroad (IME). The IME, on behalf of the Government of Mexico, recognized Flores for her outstanding contributions to the Hispanic community and her support of educational initiatives throughout her career. Flores was one of 31 honorees from 16 countries across the globe to receive the award. IME granted the prestigious award to people of Mexican nationality who have lived abroad for more than five years consecutively, and stand out for their extraordinary professional trajectory, peer recognition and their commitment to promote the image of Mexico abroad. Candidates are chosen by an evaluating committee of Mexican Embassies and Consulates. In addition to the award, winners receive a diploma and a silver medal specially coined by Casa de Moneda, Mexico's national mint. "IBC Bank's leadership team is best summed up in the company's credo, ‘We Do More,'' explains IBC Bank Chairman & CEO Dennis E. Nixon. "Margarita's efforts in this community and throughout the 90 communities that IBC Bank serves is commendable, and she is extremely deserving of this prestigious award. We are very fortunate to have her on our team to support our ongoing international business relationships." Flores is well recognized in the United States Hispanic community, not only for her professional work, but also for her personal involvement with educational institutions, veterans' support groups and business development organizations. Flores served as a corporate advisory board member of the American GI Forum, United States Hispanic Chamber of Commerce, League of United Latin American Citizens and the National Hispanic Corporate Council. She also served as board member of the Smithsonian Latino Institute, the Hispanic Scholarship Fund, the Mexican American Legal Defense & Education Fund and American Red Cross Eastern Missouri. She currently sits on the board of Bethany House and Stars Scholarship Foundation. "I am incredibly humbled and grateful to receive this award," said Flores. "I feel blessed to have been born on the border of two great nations that enrich our lives with their culture, traditions and values while simultaneously offering endless possibilities to reach the great American dream. I am also blessed to have been born into a family that places more value on what we do than what we make, and taught me that when our time is up on earth, all we leave is a legacy that will be measured by what we did for others. I have been fortunate to work with great corporate stewards like IBC Bank throughout my career, who as industry leaders, are held to higher standards of responsibility not only to Wall Street or consumers but to the community at large. It is a privilege and honor to collaborate with some of the most selfless, caring and generous colleagues at IBC Bank. Day in and day out they ensure that our efforts reach the most vulnerable in our communities and have the highest positive impact on their lives." IBC Bank-Laredo is a member of International Bancshares Corporation (NASDAQ: IBOC), a $11.8 billion multi-bank financial holding company headquartered in Laredo, Texas, with 191 facilities, 288 ATMs serving 90 communities in Texas and Oklahoma. In 2016, IBC celebrated its 50th anniversary since opening its doors for business in 1966. IBC Bank's slogan "We Do More" reflects the bank's dedication to the growth and success of both the customers and the communities it serves. International Bancshares was ranked 19th on Forbes' prestigious list of 100 Best Banks in America in 2018. IBC Bank-Laredo serves the community with a retail branch network of 20 locations. IBC Bank-Laredo was selected as "Best Bank" in 2018 by Laredo Morning Times Readers. MEMBER FDIC / INTERNATIONAL BANCSHARES CORPORATION. Follow our Facebook page, @IBCBankWeDoMore. More information is available at ibc.com.